There are several dangers facing trees in your Atlanta landscape. The dense foliage within Atlanta, “the city in a forest,” is prone to facing health problems and can need your help. Infestation, disease, and construction mishaps are causes that weaken and kill trees when they are not properly looked after. Your immediate action when a tree is in decline can be the difference in it thriving or dying. This fasttreeremovalatlanta.com article identifies tree health symptoms and causes like construction damage, insect infestations, powdery mildew, and then offers easy to perform solutions for each of them. Dieback – This is a symptom of, soil compaction, infestation, disease, or girdling and occurs when the foliage, branches, and twigs begin to die from the outside in towards the trunk. If not quickly addressed, large branches and entire portions of the tree will die and become brittle, potentially falling without forewarning. To identify an insect infestation, look for entry and exit points appearing as rounded holes with either sawdust (pitch) or sap blow the hole. Stunted Growth – When a tree is under stress from an insect infestation or disease, smaller foliage and reduced growth may occur. Often, the crown will be disproportionate with smaller and fewer leaves on one side. If left untreated, the tree’s health will continue to decline, leaving it susceptible to multiple infestations, and eventually lead to its death. Premature Leaf Drop or Late bloom – A deciduous tree stressed by compacted soil, severe infestation, disease, or partial girdling may drop its foliage in late summer before other trees, or may not bloom until late in the spring. Stressed evergreen trees may lose more foliage than usual in late summer and fall, along with signs of chlorosis (yellowing of foliage). This is an alarming sign which underscores the severity of what is happening within the tree and must be quickly addressed to save it. Drooping Crown – A common symptom of soil compaction is when your tree’s crown appears to droop, or the foliage appears to be wilted. This soil condition may cause irreparable damage to the tree’s root system resulting in hydraulic failure (when the tree can no longer transport water and nutrients to and from the roots) and eventual death. Construction damage can be soil compaction from transiting or parked vehicles and heavy storage or waste containers left under a tree. Bark damage leading to partial or complete girdling may result from leaning equipment or being struck by vehicles. These issues are not limited to construction sites, the integrity of the soil and trunk of your tree are vital to its survival and should always be protected. Construction Damage Solution – The City of Atlanta has specific guidelines on tree protection for construction sites which must be implemented. The failure of a company or person to adequately protect trees on a commercial or private construction site may be met with steep fines, and in the case of a lost tree, a tree recompense and fine may be assessed. In the case of soil compaction, it can be challenging to save a tree’s roots. Depending on the size of the tree, 15 inches to 3 feet of new topsoil may be required to counteract the effects of it. In the case of bark damage and girdling, if the damage is severe enough that it cuts through the xylem and phloem around the majority or entire circumference of the trunk, the tree may already be dead. The healthier a tree is, the easier it can repel attacks from boring insects. Likewise, these pests will typically target trees in a weakened state of health. However, when the insect population grows and trees become limited, they will target and successfully invade healthy trees too. Some beetle species will burrow into the heartwood and nest deep within the tree. Beetles carry fungal spores with them which germinate within the tree providing nutrients for their offspring and ultimately causing a fungal infection which further weakens the tree. As their numbers grow, infestations can easily devastate entire urban landscapes, inflicting irreparable damage to multiple trees of all sizes and ages. Insect Infestation Solution – When caught in its early stages, an insect infestation is easily managed through the use of insecticides, traps, and the removal of infected limbs or the source tree in its entirety. Powdery mildew is a fast-spreading fungal disease affecting a wide range of trees and plants. It commonly has the appearance of white powder stuck to leaves riddled with black spores. This disease is difficult to control, as it is spread by wind, splashing water, insect, wildlife, or human activity. In severe cases when enough foliage is covered by the disease, the host tree’s capacity to photosynthesize can be significantly reduced causing deficiencies and weakening the tree’s health, leaving it vulnerable to infestations and other infections. Powdery Mildew Solution – Halting and preventing powdery mildew can be as easy as watering your trees. The following tips will help you quickly gain control over this disease. • Neem Oil – Spray affected and surrounding foliage with a neem oil solution (2.5Tbsp per gallon of water) weekly. • Home Remedy – Spray affected and surrounding foliage with a solution of 1Tbsp of baking soda and 1tsp of liquid dish soap per gallon of water. • Garden and Pruning Equipment – All equipment used on infected plants and trees should be thoroughly washed then rinsed in a bleach solution (1/8 cup bleach per gallon of water). Alcohol may also be used in place of bleach (1 cup alcohol per gallon of water). In cases where 25% percent or more of the foliage is infected, call a tree professional to offer suggestions for a more aggressive approach to controlling this disease. Don’t let your trees die needlessly. With so many trees in an urban setting, accidents, infections, and infestations are bound to happen, are you ready for them? In this article, you discovered how to identify the problems and symptoms of a troubled tree, like construction damage, girdling, insect infestations, powdery mildew, and how to effectively treat each of them. Your failure to act when your trees are injured or ill can result in their death and toppling. Avoid catastrophic damages and potential fines or recompense from the City of Atlanta by taking action while you still can. If you could grow or plant a tree that helps fight cancer, would you do it? Before there was modern medicine, trees offered mankind natural remedies to ailments through their leaves, bark, roots, and sap. Among the herbs, and vegetables you grow in your backyard, some trees should be considered. Of the many tree species with medicinal properties, there are four that stand out and offer incredible natural benefits. fasttreeremovalatlanta.com gathered medicinal and healing property information for oak trees, pine trees, birch trees, and slippery elm trees. For all of the trees in this article, there are many medicinal properties contained just below the bark (in a layer called the cambium). However, stripping the bark from any tree can lead to its decline in health, insect infestation, fungal infection, and death. Removing rings of bark from around the circumference of a tree can cause girdling. Girdling is the strangulation of a tree, it occurs when nutrients can no longer flow freely through the cambium layer either by applied constant pressure (ropes and vines) or physical removal. To avoid girdling or the decline or death of your tree, select a branch to prune back, and use the bark from that branch. The Oak tree is a symbol of strength and endurance which has been chosen as the national tree of many countries. For as long as humans have walked the earth, oak trees have been a source of food, medicine, ceremonies, and building. Many traditions still consider the oak tree to be sacred. When made into a tea, oak tree bark serves as an effective diuretic, treats loose stools, ulcers, diarrhea, and can be gargled to soothe a sore throat. When the dried inner bark is ground into a powder, it can be made into a paste by adding water, which can then be applied to the skin to treat poison ivy, burns, or wounds. The pine tree being one of the most abundant and useful tree species on our planet, is capable of providing food, medicine, and shelter. Tea – A handful of pine needles steeped in boiling water for 5 minutes creates a tea packed with vitamin C.
Vitamins and Antioxidants – Vitamin C is an essential component of the human immune system with powerful antioxidant properties which help in the prevention of disease and chronic illness. The consumption of dried pine bark or tea from its needles provides an incredibly higher amount of vitamin C than found in any other tree species. Pine Nuts – All varieties of pine nuts are edible. As with the bark and needles, pine nuts are packed with antioxidants, as well as being rich in healthy fats. Besides being an incredibly beautiful species, birch trees with their thin papery bark and colorful canopy offer much more than an appealing aesthetic. Birch Leaf Tea – When birch leaves are steeped in boiling water, the resulting tea can be used to help heal sores in the mouth, and assist in the healing of gout, kidney, and bladder problems. Birch Bark Tea – Tea made from birch bark is an excellent detoxifier which serves as a laxative helping remove waste from the body. This tea also helps relieve the pain and discomfort caused by rheumatism, helps clear up skin conditions like psoriasis and eczema, and reduce fluid retention. Birch Sap – For hundreds of years, birch sap has been consumed as a health tonic and nutritional supplement. With a taste similar to maple syrup, the consumption of birch sap presents detoxifying, cleansing, and anti-inflammatory properties. Betulinic acid is a compound found in birch sap with anti-tumor properties which help fight specific forms of cancer. Researchers from Romania’s Victor Babes University of Medicine and Pharmacy tested betulinic acid against cervical cancer cells, breast cancer cells, and skin cancer cells. The team was able to confirm that the compound was able to halt the growth of both skin and cervical cancer cells. Birch Water – Made from birch sap, birch water is a slightly sweet, thin syrup-like drink loaded with vitamins, proteins, amino acids, minerals, and offers many health benefits. A relative of the popular American elm, slippery elm was not a popular selection for landscaping. This species only reach heights of 50 to 80 feet, while the tree develops a vase-like shape, it is not as eye-catching or graceful as the American elm. The trees you grow may keep you well. Before modern medicine, mankind had tapped into the healing power of trees and plants using remedies made from their leaves, bark, roots, and sap. In this article, you discovered the medicinal and healing properties of oak, pine, birch, and slippery elm trees. Planting a medicinal tree in your backyard landscape adds diversity to your yard’s ecosystem while offering year-round beauty and some natural remedies to basic ailments. All possible measures have been taken to ensure the accuracy, reliability, timeliness, and authenticity of the above information; however, fasttreeremovalatlanta.com does not take nor assume any liability. Using any of the information provided by this article is solely at the readers’ discretion. In case of any medical emergencies or persistent health issues, fasttreeremovalatlanta.com advise you to seek qualified medical attention before putting to use any advice or tips given by any third party. Preventing trees from dying is easier when you understand their basic fertilization needs. When you blow or rake away fallen leaves, you are removing the tree’s natural food source. Read on to discover how to replace it. Without periodic soil testing and fertilization, your tree’s health may decline. When this happens, insect infestation and disease may successfully attack and kill your tree. fasttreeremovalatlanta.com collected information about fertilizer use, composition, and application, offering valuable insight into keeping your trees robust and healthy. Why Do We Fertilize Trees? Trees in landscapes and urban settings will require periodic fertilization to grow and remain healthy. In other settings, trees are able to fertilize themselves through the decay of fallen leaves and needles. The trio of hydrogen, carbon, and oxygen are used for cell formation and the production of food within the tree. While carbon and oxygen are absorbed from the atmosphere, hydrogen is acquired from the water absorbed by the root system. With the natural decay of organic material or the application of fertilizer, the remaining nutrients and minerals necessary can be acquired from the soil and absorbed by the tree’s roots. One of the principle reasons for fertilizing trees is to keep them healthy. Healthy trees are highly capable of defending themselves from insect infestations and diseases. When their health is compromised, the weather, insects, disease, and wildlife can contribute to their rapid decline and death. As a rule of thumb, fertilizing trees should be done in the fall (after the growing season) or in late winter (before the growing season begins). • The leaves appear yellowish through the summer. • The leaves gradually reduce in size each year. • There is minimal growth, even with optimal conditions. • Fall color change and leaf drop occur early. Before fertilizing and hoping for the best, call a professional tree service or arborist to evaluate the situation. What Fertilizer is Best for My Tree? Annual soil tests can help you determine the correct fertilizer composition. These tests also help you determine the pH level of the soil. For trees that thrive in acidic soil, the pH level should be 6.5 or less, for those in base soil, that level should be 7.5 or above. Soil considered neutral has a pH of 7.0 (6.5 – 7.5). Soil pH levels are easily adjusted by the addition of phosphoric acid or sulfur to make them more acidic. The addition of limestone, organic mulch, or wood ash will reduce the soil’s acidity. Many brands of fertilizer contain one or a combination of the above to adjust the soil pH level. More often than not, the missing or deficient element in the soil is nitrogen, and as such, the majority of fertilizers contain it. So, if the packaging of a fertilizer reads 10 10 10, that means that it contains 10% N, 10% P2O5, 10% K2O, and 70% inert filler. If there is a 0 in one of the three positions, that means the corresponding element is absent from the product. Use these numbers to buy the fertilizer that will replace the deficiency in your soil. Surface Application – Granular forms of fertilizer are evenly spread on the ground around the tree. Fertilizer Spikes – This method involves driving fertilizer spikes into the ground spaced out around the tree. Foliar Fertilization – This method uses liquid fertilizer directly applied to the foliage of the tree. Filling Holes – Similar to the use of spikes, holes 1in in diameter and approximately 18in deep are filled with fertilizer. The holes should be about 3ft apart beginning 6ft from the trunk and extending just beyond the reach of the canopy. Don’t allow your trees to starve to death! The soil composition of your yard may ultimately determine whether your tree grows and flourishes or withers and dies. In this article, you discovered the importance of using fertilizer, its composition, and its proper application to promote tree health. You also uncovered the importance of the soil’s pH level and how fertilizer can help you adjust it. Failing to provide essential nutrients to your trees can weaken them, leaving them vulnerable to insect infestation and disease. In short, neglecting to fertilize your trees when they need it can kill them. Trees around the world are dying, and they’re going fast. Can we figure out how to remedy this before it’s too late? Trees on a global scale are being threatened and are dying from drought, disease, insects, and fire as average worldwide temperatures are on the rise. Individual action to plant and protect trees can and should be taken. fasttreeremovalatlanta.com collected information demonstrating how global warming and climate change have adversely affected trees all over the world, including screwbean mesquite trees, ancient baobab trees, dying forests in California, and the plight of the pines in Canada’s Jasper national forest. As global warming leads to climate change, trees are forced to adapt or die. While many tree species are able to accommodate subtle temperature changes, there are those that are unable to cope with the environmental changes. Read here about climate change and the future of deciduous trees. Warmer temperatures translate to a longer growing season. This produces larger trees with less wood density and a lower capacity to absorb and store carbon dioxide. Carbon Starvation – During a period of drought, trees will go into a state of conservation where they all but cease carbon dioxide absorption, thus dramatically reducing photosynthesis and the production of nutrients for the tree. While many trees species have evolved to withstand drought, their decline and eventual death are hastened as periods of drought become more frequent and lengthy. 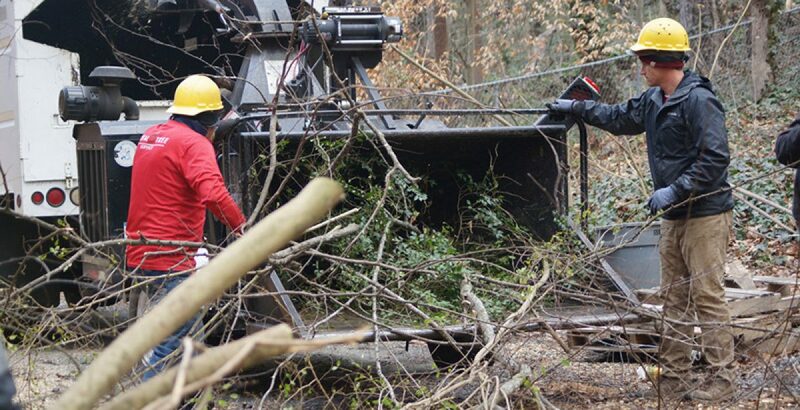 Hydraulic Failure – During periods of prolonged or severe drought, the lack of water also known as hydraulic failure can quickly debilitate and kill trees. Bark Beetle Infestations – This same increase in temperatures also leads to more favorable conditions for wide-spread bark beetle infestations including in high-elevation pines. As a beetle bores into the bark of a pine tree, it is met with resin, the tree’s primary defense mechanism. During periods of drought, the resin flow from pine trees is reduced, lowering the tree’s capability to repel the beetle’s attack. Weather acts as another of the tree’s defense mechanisms against bark beetles. To kill a beetle brood, winter temperatures must remain below freezing for at least a week, and even this depends on the species of beetle. To illustrate the warming tendencies across the continental United States, look no further than the USDA Hardiness Zone Map. The image below represents temperature increases between 1990 and 2015, subsequently causing a shift in the borders and sizes of the hardiness zones. Some of these changes are significant enough to alter species selections for landscapes and gardens, more notably in the southern states. If these changes continue over the coming decades, plants and tree species planted as little as 30 years ago may succumb to their changed environment. Found in western Texas, New Mexico, Arizona, Utah, California, southern Nevada, and in northern Mexico, the screwbean mesquite tree is a well-adapted species for desert climates. Yet, this tree species is rapidly dying off. Temperature Increases – While desert vegetation is uniquely adapted to withstand high temperatures and sparse rainfall, it is the increase in overnight temperatures that may be causing the decline and death of this species. African baobab trees are long-lived, with some having thrived for over 2,000 years. That is, until recently. According to a recent study of the eldest of the species, they have all begun to decline or die. Most striking is that baobab trees that have persisted for so long are now dying one after another, indicating a dramatic change in their ecosystem. The effects of rising temperatures, infestations, and drought on forests are abundantly clear in California’s forests. In mid-2016, aerial surveys documented that nearly 28 million trees had died in the California forest landscape. With a landscape already prone to wildfires, California in recent years has seen its most destructive fires leave paths of devastation through communities and entire cities. As average temperatures rise around the world, invasive diseases, pests, and drought are taking their toll on the global tree population. In Europe, studies have revealed that warmer temperatures have created a longer growing season, producing larger, but weaker trees. Canadian forests are being decimated by mountain pine beetles. As temperatures rise, the beetles are able to survive and successfully attack in higher altitudes. Jasper National Park in the Canadian Rockies is a perfect example where nearly half of the park’s trees have been affected and are either in decline or dead. Tree diseases are also on the rise. In the recent past, Dutch elm disease and hemlock woolly adelgid caused catastrophic tree loss in eastern forests. In 2010, it was found that Hawaii’s ohi’a trees were infected and dying from what was called ohi’a death disease. By 2016, nearly 50,000 acres on the big island’s native forest were found to be infected with the disease. Currently, Beech leaf disease is posing severe threats by rapidly spreading to Beech trees in all stages, including saplings, mature trees, and those that are centuries old in the northeastern United States and Canada. Trees are being negatively impacted on a global scale by rising temperatures. Without a solution in thecoming decades, our forests may all be at risk of dying. In this article, you discovered how the world’s tree population is struggling with rising global temperatures, drought, aggressive diseases, insect infestations, and wildfire. You also found out that screwbean mesquite trees, African baobab trees, and North American pines are under incredible environmental stress. It may seem that on an individual level we are helpless to halt or reverse these climatic changes. However, we can plant trees and shrubs in their correct hardiness zones, take measures to control tree pests and infestations, and provide ample water for your trees. Author Fast Tree Removal Services AtlantaPosted on December 24, 2018 Categories UpdatesTags Atlanta tree removal service, emergency tree removal Atlanta, tree cutting services, tree pruning Atlanta, tree removal Atlanta, tree service Atlanta Ga, tree trimming AtlantaLeave a comment on Why Are Trees Dying All Over the World? Summer is over and with it goes the growing season for trees. As cold weather quickly approaches, now is the time to help your trees prepare for the winter months. By lending a hand to your trees in the fall, they will suffer less winter damage, making them more resistant to disease and infestation in the spring and summer months ahead. fasttreeremovalatlanta.com gathered essential information and tips for both evergreen and deciduous winter tree care, including information on dormancy, deep watering, tree wrapping, pruning, and other preparations for the coming winter season. All of your tree’s roots are on a continual march to supply water and nutrients to the tree above. They can spread 2 to 3 times the size of the canopy, and given the right soil and moisture conditions, they will grow very deep. During the fall months, those same roots begin collecting and storing water for the coming winter months when water is often unavailable or unable to penetrate the ground. Throughout fall and right up to the first freeze, give your trees a weekly deep watering. Deep waterings are generally defined as allowing enough water flow to saturate the top eight to ten inches of soil. Mulching is beneficial in many ways. It naturally curbs the growth of weeds, adds nutrients to the ground as it decomposes, and more importantly helps the soil maintain warmth and moisture. Fall is the perfect time to mulch your trees with a 3 to four-inch layer of organic mulch start at the base of the tree (without covering the root flare) and extending to the tree’s dripline. If there is an existing layer of matted mulch, it should be fluffed or removed before adding another layer. The combination of deep watering with proper mulching is one of the most significant advantages you can offer your tree in its fight to remain healthy. Sometime back in mid to late summer, your trees stopped growing. They naturally did this to allow their new growth time to mature or “harden” before winter. As temperatures begin to fall, another internal trigger is about to go off. The leaves of deciduous trees will start to change color and eventually drop to the ground signaling their entry into dormancy. While evergreens do not lose all of their foliage, they do slow down during winter months and will benefit just as much from your fall assistance. The safest time of year to prune your trees is in late fall once your trees have gone dormant. Pruning at this time allows you to remove unwanted, damaged, or dead growth while encouraging future spring growth. As the threat of insect infestation and fungal infections are significantly reduced in late fall, your biggest concern is making sure that the cuts are made properly so the tree can compartmentalize the wound and heal itself quickly. Read Ideal Times for Tree Pruning, Cutting and Emergency Tree Removal then watch this video to see how a proper pruning cut is made. Recently planted trees, especially those that are not native to your region require special attention. As it may take a tree several seasons to acclimate itself to its location, the following should be done to protect it from winter elements. Burlap coverings are placed around evergreen shrubs and trees in the winter to protect them from the sun and wind. A frame or stakes should be used to prevent as much contact with the foliage as possible. Read 3 Tips for Young Trees – Pruning, Tree Care and Protection then watch this video to see how easy it is to apply trunk wrapping. Q: Should I Water New Trees in Winter? A1: Yes – during mild or extremely dry winters. Deep watering once a month will help get moisture to the roots. A2: No – if the ground is frozen or there’s significant moisture or snowfall. Q: Why do you wrap a tree in burlap? A: Burlap effectively protects plants from winter burn which is a combination of direct sunlight, wind, and low soil moisture. Burlap allows the tree to breathe and doesn’t trap heat which makes it much more desirable than plastic or other materials. Q: Can a tree freeze to death? A: Yes. But very unlikely. While half of a tree’s mass is water, trees won’t entirely freeze. Trees alter their living cell membranes to be more pliable, allowing water to evacuate the cells and rest between them. As this winter season and dormancy approach, knowing how to water, prune, wrap, and protect your trees will help them emerge stronger and healthier in the spring. In this article, you’ve learned about deep watering in the fall, and how mulching preserves warmth and moisture for roots. Also covered was when and how pruning should take place, how to protect young trees, and some of the common questions other tree owners are asking. By leaving a tree to fend for itself during the winter months, you are risking the decline of its health, infestation, illness, and ultimately, its death. Dead, dying, or weakened trees may fall at any time posing a tremendous risk to your property and to your physical safety. Your affordable and professional tree service in Atlanta Ga, Fast Tree Removal Services Atlanta offers expert, fully licensed and insured emergency tree removal services, tree trimming and tree cutting services in Metro Atlanta.Our Atlanta tree service handles jobs ranging from dangerous tree removal to 24 hour emergency tree services and preventative tree care plans. We offer all customers a no-risk FREE estimate. Our tree care specialist will diagnose your situation and provide the best solution. Fast Tree Removal Services Atlanta Create a free website or blog at WordPress.com.